Watermelons. Peppers. Salad greens. Flowers. Not pictured: Tomatoes. Happy August! 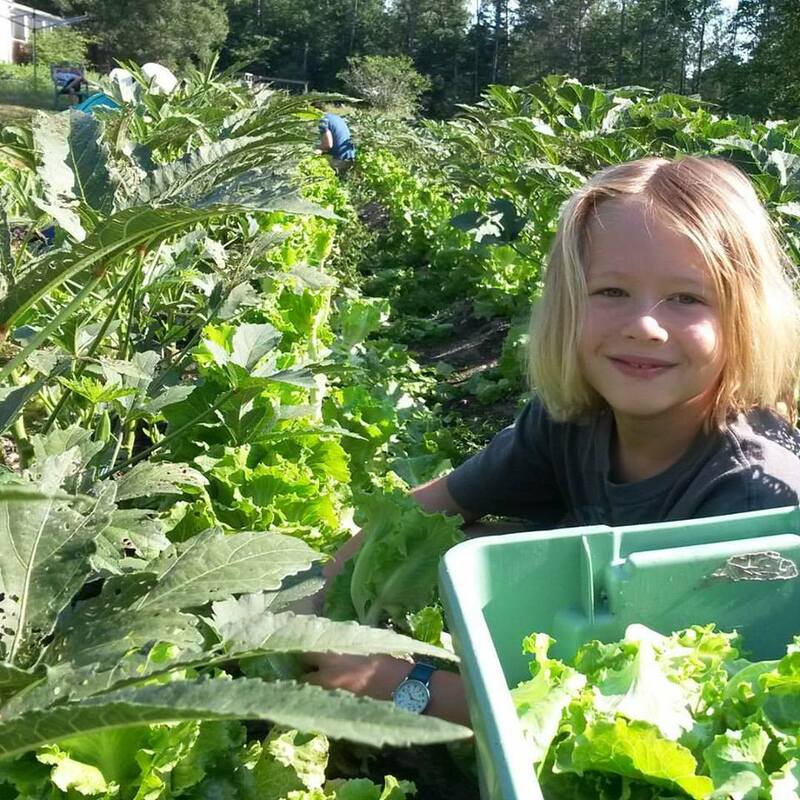 Saturday’s/Monday’s Farm Share will most likely include: Salad Mix, Lettuce, Slicing Tomatoes, Cherry Tomatoes, Sweet Orange and Red Peppers, Non-Spicy Jalapenos, Summer Squash, Cucumbers, Garlic. 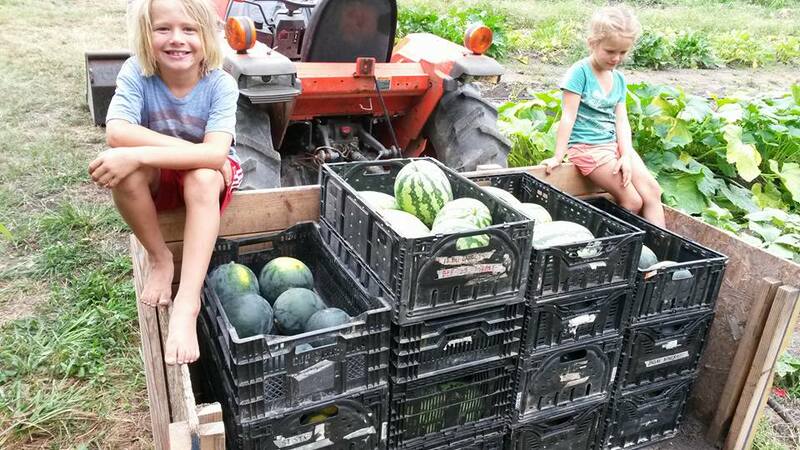 Farm Share CSA Members – Third and final payments were due Aug 1. (If you’ve paid the correct amounts all along, $225 remains due for vegetables, $53 for Bread Shares.) Not sure what you owe? You can check on your balance here. If you have already paid in full, Thank You! *Non-Spicy-Jalapenos – What are these about? you may be wondering…We love the flavor of jalapenos but our jalapenos were so hot last year that we (and some of our members & customers) weren’t able to enjoy the flavor. 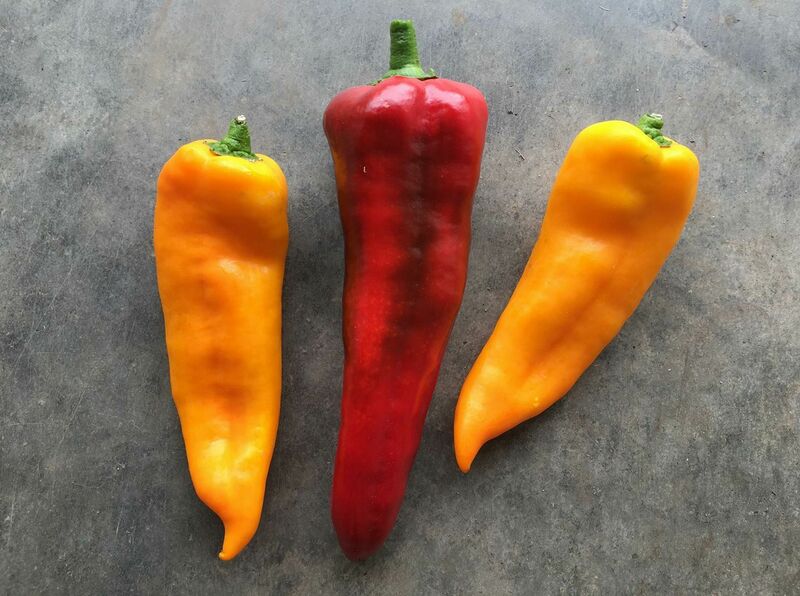 When we found this option for seeds for non-spicy jalapenos from our trusted seed supplier last winter we were very excited. Thus, we encourage various recipes that allow the flavor to be enjoyed. Whether your style is Vegan Jalapeno Poppers v 1 or Vegan Jalapeno Poppers v 2, or Bacon Wrapped/Cheese Stuffed Jalapeno Poppers, or Sausage Stuffed Jalapenos, we hope you enjoy these. (See photo above of our stuffed and baked version.) Feedback is welcome. We don’t think we can grow both spicy Jalapenos and non-spicy Jalapenos the same year (how could we be sure they didn’t get mixed up???) and we’d love to know which our members prefer that we grow next year. Cherry Tomatoes – If you can resist eating them all raw as a sweet snack, you can enjoy Roasted Cherry Tomatoes. They turn into a special sort of candy when roasted. Serve them alongside any dish. Slicing Tomatoes – If you don’t eat them all up on sandwiches, salads, and as salsa/pico de gallo/tomato relish, then you can make and freeze sauce for later. See this How to Freeze Tomato Sauce in 6 Easy Steps for a simple recipe using 3-4 tomatoes – just the amount from our Farm Share that you may not eat right away. Sweet Peppers – If you can’t enjoy all of them raw, you can freeze, dry, or can peppers. See here for Three Ways to Preserve Peppers. Specifically, we like to Roast and Freeze Sweet Peppers. But we eat a ton of them each week this time of year. Diced raw with tomatoes and tossed with garlic, sea salt, and olive oil is a house favorite. 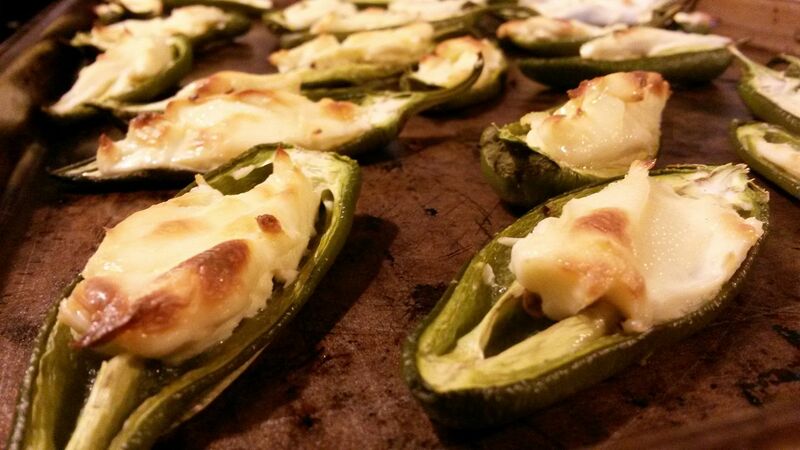 We also love all peppers halved, stuffed, and roasted. Fill with cheese of choice, and/or tomato sauce and protein. We also enjoy them raw as boats for any sort of savory protein: cream cheese, humus, salmon/tunafish salad, etc. Summer Squash (and Onions and Garlic and Sweet Peppers – Don’t tell our two squash-protesting kids that we have been sneaking summer squash into their dinners a lot recently. Dice quite small, along with our onions, garlic, and sweet peppers, they hide very well sauteed and then mixed with cooked quinoa. Add salt and pepper to taste, plus cheese (dairy or vegan) of your choice. We used parmesan. Plus add any fresh herbs you have on hand. This Summer Squash and Red Quinoa Salad is very different that what we have been making, but it’s a similar theme. 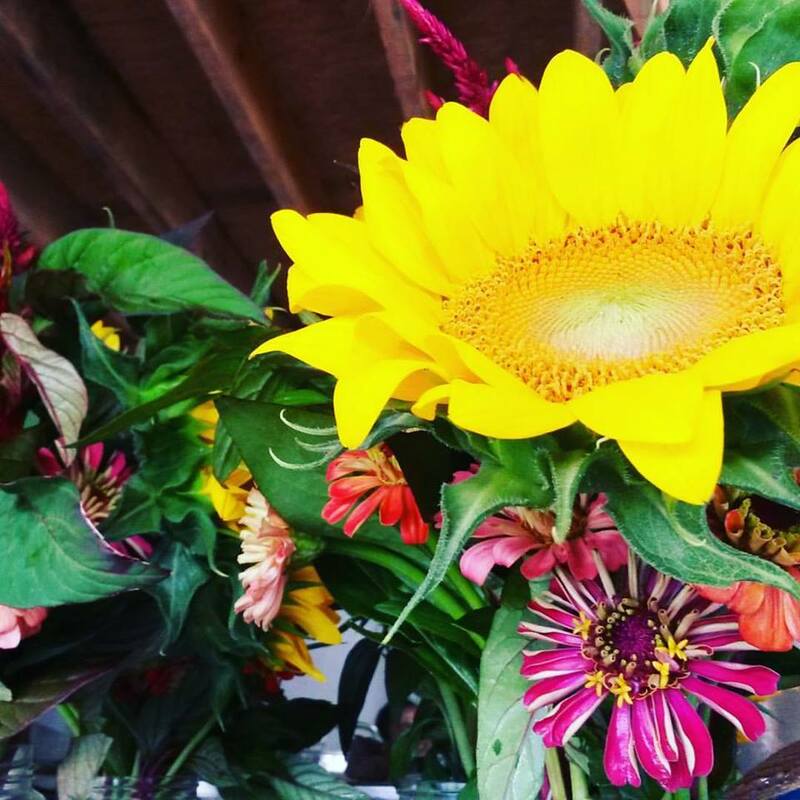 2017 Market Share CSA Members: Reserve your selection online to pick up Saturday, Aug 5th at our farm, at the Brandermill Green Market, or at the Farmers Market @ St. Stephens.